1 In shallow bowl, combine 1/4 cup bread crumbs with 1/4 teaspoon pepper; set aside. 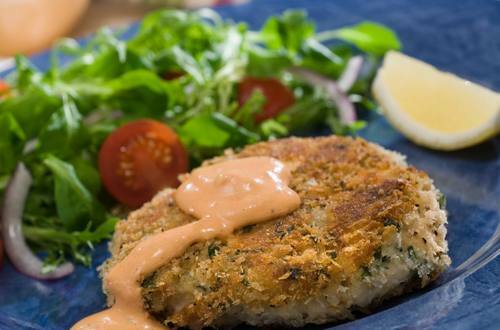 2 In medium bowl, combine tuna, Hellmann's® or Best Foods® Real Mayonnaise, parsley, mustard, remaining 1/4 cup bread crumbs and 1/4 teaspoon pepper. Shape tuna mixture into 6 patties, then dip in bread crumb mixture until evenly coated. 3 In large nonstick skillet, heat oil over medium-high heat and cook tuna cakes, turning once, 6 minutes or until golden brown. Serve, if desired, on lettuce with Roasted Red Pepper Sauce*. *Roasted Red Pepper Sauce: In blender or food processor, process 3/4 cup Hellmann's® or Best Foods® Real Mayonnaise, 1/3 cup roasted red peppers, 1 clove garlic, 1 tablespoon lemon juice and pinch ground red pepper (optional) until smooth. Chill, if desired.